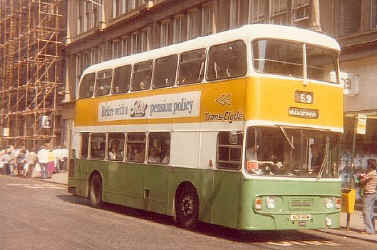 In 1973, the Greater Glasgow Passenger Transport Executive was established to coordinate public transport in the newly formed Strathclyde Region. It also inherited a bus company (which was nice) namely Glasgow Corporation. After careful consideration the PTE decided to rename the company after itself, thus GGPTE was born. During its formative years the PTE introduced some radical concepts. They attempted to present an integrated transport solution to a largely oblivious ridership. They chose the name "Trans-Clyde" to promote this integration of train, subway and bus services (left). However what the public did notice was "Freddie Fast Fare" - the bain of every Glaswegian's life. The PTE adopted a no-change philosophy and the passengers in return adopted a no-smile philosophy. When the Glasgow boundary was abolished with the 1980 Transport Act, suddenly people could travel on Scottish Bus Group vehicles for local journeys - and they gave change. The PTE however never relented. GGPTE modified the layout of the Glasgow Corporation livery, painting the vehicles in a much breezier version of green and yellow, supplemented by copious amounts of bright white. It was a positive image for the somewhat negative times of the 1970s (above left). However the PTE liked to dabble, so it began to experiment with variations, reducing the white to a single band (upper right) and eventually replacing it altogether with fashionable 1980's black (lower right). After the golden era of GGPTE came the stark orange nightmare of Strathclyde PTE and the enveloping purple haze of First. 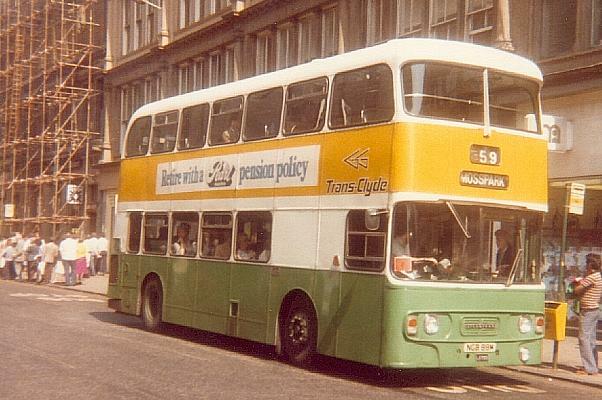 In common with other PTE companies Glasgow did not operate many single deckers in the 1970s. It inherited unusual Alexander bodied Leyland Panthers from the Corporation, some of which it converted to dual-purpose vehicles (top left). The PTE bought and operated more conventional coaches in the shape of Duple bodied Leopards (middle left) which were used for private hire and on express services. It bought a small batch of Leyland Nationals new in 1978 which spent most of their time in the east end of the city (lower left). Further unusual single deckers arrived in the shape of second-hand baby Seddons from Manchester, which were used on the station link service (right). 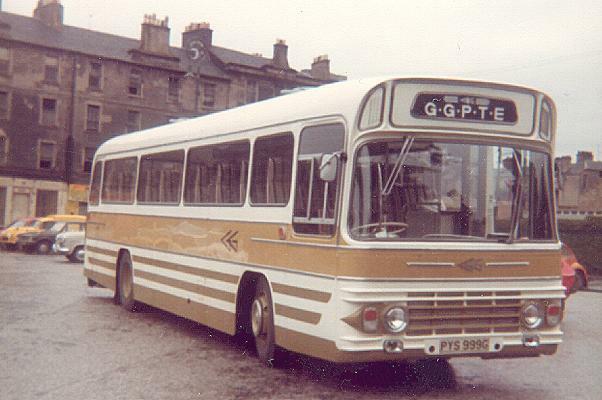 GGPTE was one of the largest operators of Leyland Atlanteans in the country. Nearly 1500 were delivered and when the final ones arrived in 1982 the hunt was on for its replacement. Small batches of Metrobuses (left) and Olympians (right) were bought until the PTE settled on the familiar Volvo Citybus. Although Glasgow had many Atlanteans, they were early supporters of the locally produced Volvo Ailsa (left). Many of the Atlanteans were delivered in two-door configuration. However apparently the Glasgow public had difficulty understanding the centre door principle (admittedly tricky after 10 pints of McEwans and a kebab supper). So over 300 vehicles were converted to single door arrangement (right). Where did all those centre doors go ? Some photos may not be up to the usual standard as they were taken with an instamatic camera. The large fleet of Leyland PD3s that GGPTE inherited were soon withdrawn, and many went into the driving school, such as these seen at Knightswood depot in January 1976. A small fleet of Metropolitans used to prowl round the streets of Glasgow. A very shiny M24 (JUS744N) is seen in Union St in July 1975. Citizens Theatre overall advert Atlantean LA439 (PYS967G) at the top of Buchanan St (now pedestrianised) in July 1976. Amazingly this vehicle was withdrawn in 1979 when just over 10 years old. Cameron & Campbell overall advert Atlantean LA391 (MUS276F) at Knightswood depot in January 1976. A classic panoramic windowed Alexander bodied Leyland Atlantean LA1345 (LSU402V) in original GGPTE livery behind Lewis's in August 1980. Atlantean LA818 (SGD711N) at St. Enochs bus station in May 1981. Atlantean LA1410 (RDS599W) at St. Enochs bus station in May 1981. On its farewell tour in the High St, Leyland Panther PYS999G on a suitably wet day in July 1978. During the peak years of express services in the early 1980s the PTE would regularly supply vehicles to Western for their cross border summer Saturday journeys. Duple/Leopard OGD659V is seen at Buchanan bus station in July 1980 preparing to depart on the (980) service to Southport. 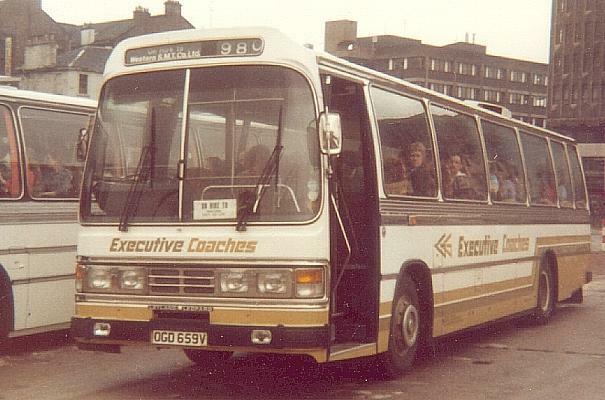 Leyland National LN8 (GGE163T) at Parkhead depot in August 1983. Seddon S1 (XBN976L) at Queen St station on the station link service in July 1979. Looking rather smart, MCW Metrobus II MB32 (MUS310Y) at the top of Hope St. in April 1983. Same place, same route, same day: ECW-bodied Olympian LO16 (CGG839X). Seen at Larkfield depot in July 1983 is Volvo Ailsa AV1 (GGG300N). Atlantean LA720 (NGB88M) in Union St in June 1980. Note the Trans-Clyde names and the metallic-style fleet number plate.